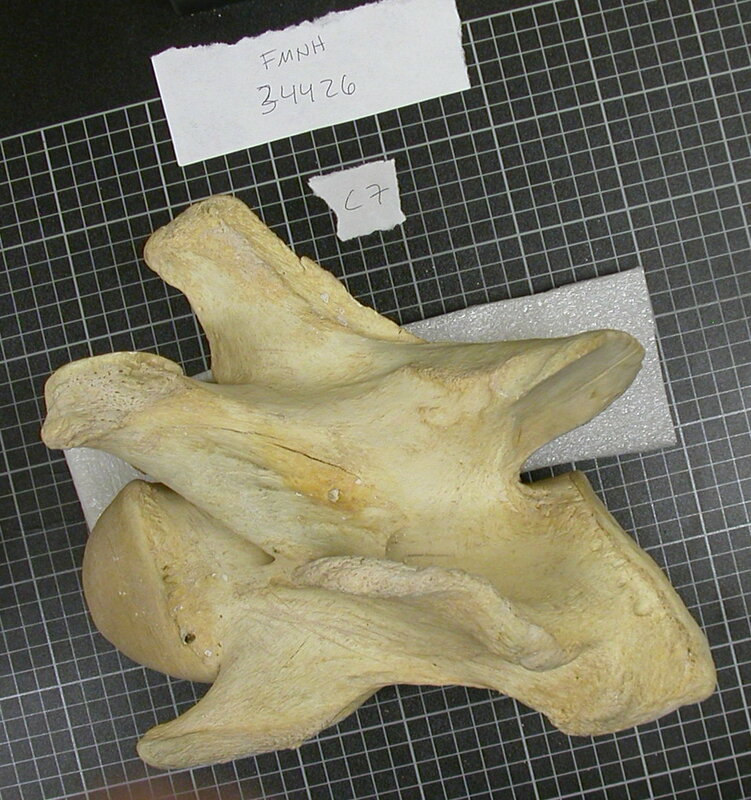 I would think that the “articulate two copies of the same vertebra” would be likely to give bizarre results applied to something like the seventh cervical of the giraffe. 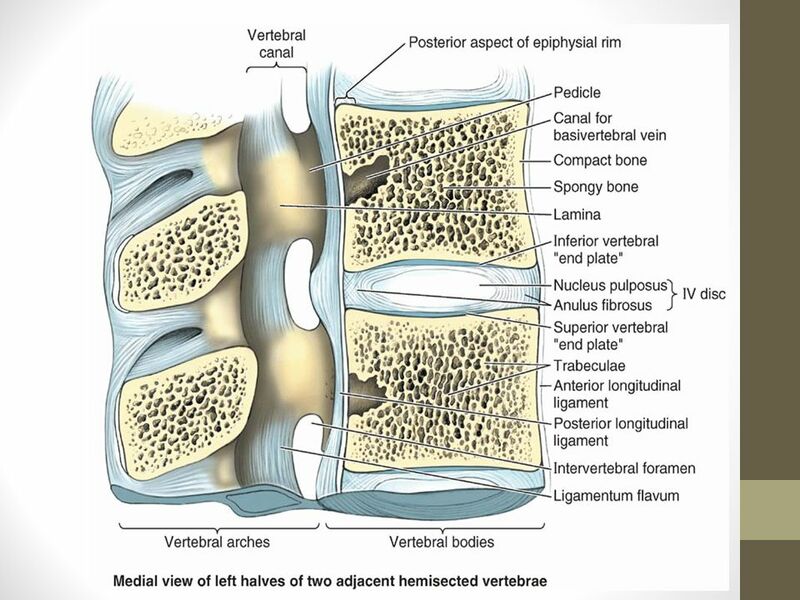 After all, that vertebra is a sort-of “elbow” in the column, connecting series (dorsals and cervicals) that in life are likely to be oriented in different directions: the whole point of its key-stoned “design” is that it connects to very differently shaped vertebrae on its two sides. My gut instinct is that something like B is what, ideally, one would want to use — something that would be biologically significant in the living animal — but as you point out it is very hard to use (or even make precise), particularly if you don’t have an articulated series. Best practice, I guess, would be to include a definition of the sense of “horizontal” used in the supplemental information of any paper in which traits defined in terms of horizontality are used. Has to be “A” since that is the view you would figure. Your manuscript would refer to the slope as the viewer would see it figured. Ken, is that not begging the question? How do you know how to orient the vertebrae when putting together the figures? Mike could have titled the post, “How should we orient vertebrae when we figure them?” and all of the body of the post could remain unchanged, and us no closer to an answer (justified by anything other than fiat). In any case, tt’s not clear to me that the centrum ends automatically trump the neural canal – especially if the centrum ends aren’t parallel, as in the case of the giraffe C7. I mean, maybe the centrum method is better, but it would be nice to have some actual reasons. I usually assume the standard orientation as the long axis of the centrum (or the proximodistal direction along the centers of the articular facets in shortened vertebrae) to be oriented perpendicular to the direction of the gravity force vector. (I assume no paleontologists work in the International Space Station, so the Earth gravitational field is a natural setting share by all those reading the description of my vertebra and can use it as reference parameter). 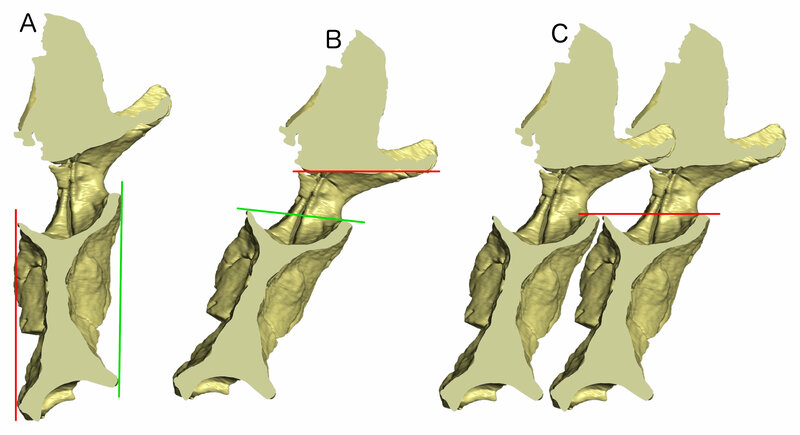 This is the reason in theropod osteology we consider the posterior cervical vertebrae as “titled” at articular facets of centrum and not, instead as “sloped” at zygapophyseal facets. Ah, but Matt, you sort of answered the question yourself. No one figures vertebrae as B or C, ergo A. The camel vert is a red herring because the sauropod example is anteroposteriorely short, not elongated. Your own publications show elongated cervicals as oriented with the axis through the length, so you know the answer to your own question. The question really is not how to illustrate a vertebra, but what criteria defines how to measure slope (although “inclined” is probably a better term). It really does not matter so long as it is defined: “midline axis of neural spine inclined 30 degrees vertical relative to plane of posterior centrum face.” Note that it really is necessary to define where the inclined axis is measured for replication. Ah, but Matt, you sort of answered the question yourself. No one figures vertebrae as B or C, ergo A.
That’s a courageous assertion, particularly in light of Borsuk-Bialynicka (1977: plate 5). That’s only true if this is a trivial methodological problem. If there are real biological questions at stake, it does matter. In any case, I’m not the one arguing that we should define the orientation based on how things are illustrated!